Your hot water heater is one of the most important appliances in your Laurel home. After a long winter, your current unit might be worn out. Even though spring isn’t officially here yet, it still feels cold at night. What better way is there to get ready for bed at night with a relaxing warm bath? 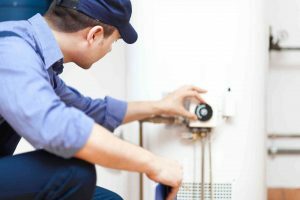 Let’s take a look at some other reasons you’ll need hot water heater repairs in Laurel this spring. You’ll know that you need hot water heater repairs in your Laurel home when your current tank reaches a certain age. It’ll start showing some warning signs that you will need repairs. In some cases, you might need a complete replacement instead. You can check the age of the water heater by examining the serial number printed on it. The letter you’ll see, such as A, is associated with the month it was originally manufactured. Then the next two digits, such as 09, indicate the year it was originally manufactured. So if you see A09, you’ll know it is from January 2009. Rust is never a good sign when it is in or around water. Water heaters are no different, no matter what type of water heater you have. So rust is another sign you need hot water heater repairs in your Laurel home. Rust in hot water means that the problem is coming from inside the water heater itself. This sign could point to a possible leak. However, it’s possible that rusty plumbing in your Laurel home is the culprit. Somewhere in your neighborhood, there could be sewage work going on, so try and rule that out as a possibility before panicking. No one wants to hear their hot water heater make odd noises. Strange sounds coming from any part of your home isn’t just unsettling, it could also be a warning something is about to go wrong. Hardened sediment forming at the bottom of your hot water heater could be the problem in this instance. Once you determine this is the real reason for all of the trouble, hot water heater repairs won’t make much of a difference. Flooding can be a problem due to the weather. But if you don’t see flooding affecting your Laurel neighbors, then the excess water in your home might be due to a leak. Water pooling around the outside of your heater is a sign that it has sprung a leak. Give Master Plumbing a call at (301) 650-9100 or contact us online to get more information on how our expert plumbers can help you with your Washington DC home’s plumbing system. We have received Angie’s List Super Service Award recognition for plumbing and drain cleaning every year since 2007, in addition to the Best Plumber award from Best of Bethesda. We are fully licensed, bonded, and insured and our service is unparalleled. Give us a call today—you won’t regret it! To see examples of our projects, follow us on Facebook, Twitter, and Pinterest.